Today I'm taking on the, apparently, much loved visual novel Grisaia no Kajitsu to see how it holds up. After my rather scathing random thoughts article, I'm here to take a more level-headed approach to the game and pick it apart objectively. Grisaia no Kajitsu first crossed my path when Tye-The-Czar mentioned it in my Muv-Luv review after he said that he prefers to recommend it over Muv-Luv. Of course, he says this without having played Muv-Luv (this is why spoilers are bad), but I'm not going to judge anyone here. After that, it started popping up in a number of places. A couple of my friends and acquaintances made some bold proclamations about the game as well. Further, many places on the internet are littered with people recommending it after playing Muv-Luv and G-Senjou no Maou, either implying or outright saying that it is just as good, if not better than both. So, that's when I picked it up to play through. Its taken me since just after my Sharin no Kuni play through (mid-to-late March), but it has taken this long for me to get four routes (all endings to each route) cleared. That's why I've held off this long. I'll be honest, this game is pretty. It's one of the visual novel's best characteristics with its excellent art direction and good (not quite great though) character design. The uniforms, the characters, and the backgrounds end up being one of the finest points in the game overall. There's quite a bit of minute polish that went into the scripts and the imagery of this visual novel. Most of the lines in the game are very well written and there's nothing really overtly wrong with anything they did. There isn't any hammy writing or glaring plot holes (just ridiculous plot conveniences). Look, they aren't bad plots, but honestly there's just not enough here. Each route is worth playing through if you're already playing Grisaia, but it's not something I'm going to go around talking about. These plots tend to end pretty well, but they're also prone to do completely off-the-wall bonkers things to resolve themselves, only to furiously hand wave any consequences for their actions away for some reason. This has been a facet of at least two of the routes that I've played, and it seems likely to be three if I ever get to the last route. Much like the plots, the characters aren't bad, but there's little subsistence here for the prolific reviewer like myself. I've seen the characters before, many times. Any time the game tries to differentiate itself from the archetype, it's either predictable or just forced to some effect. Take the resident Loli Makina: she's small, cute, and has a high-pitched voice. She's got the loli checklist filled out. The way they differentiate her? She's got a tenuous grasp on grammar and tosses out dirty comments at every turn. Honestly, I really, really want to appreciate this, but it just comes off as so... forced somehow. I think it's because there's a point where you take the joke too far, and Grisaia went leaps and bounds past it. This is evident in how I lost interest in hearing what Makina had to say by about the halfway point of the game. All the characters are pretty similar, it seems like the joke goes too far and it has trouble maintaining a sense of... reality. Yeah, that's it. These characters, while nicely written occasionally, tend to come off as caricatures rather than people. Their problems are odd, their personalities are suspiciously simple, and the way their routes resolve are either hilariously exaggerated (hey there Sachi's route!) or a poignant character moment with the subtly of a freight train (hey Amane's route!). Grisaia no Kajitsu has absolutely, stupendously, atrociously no sense of pacing whatsoever. I'm not even kidding, this is the only visual novel to date that I've found myself considering playing it more of a chore than a version of fun. I absolutely will not sugar coat this. 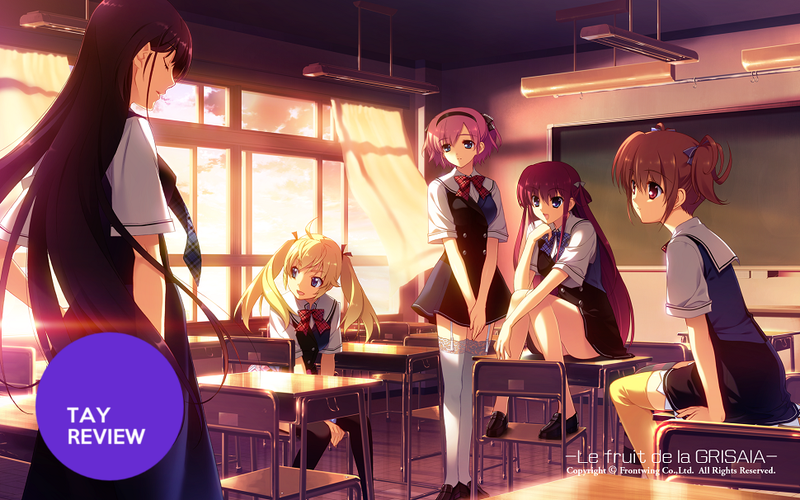 As I've said before, when it's at its best, Grisaia is brilliant and great. The problem is that over 90% of the game is painfully average and slow-moving. It has no sense of the word pacing. One of the things that accentuated this blatant flaw is the utter lack of a hook. While games like Muv-Luv had the decency to get out fast and G-Senjou no Maou had a massive hook in the form of the main character and the conflict with Maou, Grisaia has nothing. This owes to its slice-of-life aspects, obviously, but even most slice-of-life genre pieces have some sort of hook that makes you want to come back. Grisaia banks hard on its characters, but this backfires because of the pacing that mentioned above. If I'm sick of these characters by the time we get to the good part, then it was literally all for naught. You've heard of Hype Backlash right? This game was hype disaster for me. Some people played this visual novel up like it was the second-coming of Muv-Luv, while others at least had the courtesy to go as low as "it's as good as G-Senjou no Maou", which is already high. The result was the worst hype backlash I've experienced in years. If you're going to compare a game to Muv-Luv Alternative or G-Senjou no Maou, you damn well better mean it. The first problem here is that comparing this game to either of those visual novels is a disservice to it, they're completely different. Both Muv-Luv and G-Senjou have strong plots and great pacing, while Grisaia has neither. Grisaia, at best, is a character study. Represent it as such. Secondly, it's not as good. It's just not. I walked away from Muv-Luv gaining something. I walked away from G-Senjou with a rush of feels and optimism that I wasn't expecting. I walked away from Grisaia and started playing another visual novel because it really had nothing to tell me or give me. It's a good visual novel, but it's not on the same level as either of the other visual novels or ones like them. Let's stop hyping it as such. There's too much of this, okay? I can already see the counter-points here that it's necessary for character development blah blah blah. No, there's better ways to do this. That's something that Katawa Shoujo taught us. I think Frontwing needs to spend less time here and more time editing. At the end of the day, it is a good, well made visual novel that does a few things right. It just has rampant problems with actually coming up with a reason that we should be playing it. It doesn't really say anything particularly profound and it doesn't have a wealth of interesting topics that it's exploring, but it does succeed at being a character study (although the extent to which these characters are worth exploring is up for debate). It's pacing is pretty atrocious and it suffers from the lack of a hook, but that's all it really has problems with in the end. With extensive editing, I'm sure Grisaia could have been a great visual novel that could make it onto my favorites list, but it just takes so long to get the point that I got fed up with it. It's art and direction are generally pretty good and the plots, while simple, at least serve as a way to explore the characters. It's not as good as Muv-Luv, but it's also not really supposed to be compared to it at all. Their goals as visual novels are entirely different. While Muv-Luv was a plot-heavy VN that happened to have great character exploration, Grisaia no Kajitsu is a character study that happens to have a plot. They aren't comparable in many ways, so stop acting like it. I'll maintain my statement that I said in in my ramblings article, which is that you won't gain anything Grisaia that you didn't already get from Katawa Shoujo or Sharin no Kuni. It's a good visual novel, but it isn't a must-play by any means. This review is part of my video game review series. I will be running it parallel to my Anime Marathon series. You'll be able to find all my video game reviews on Dex's Corner using the tag "Game Review".